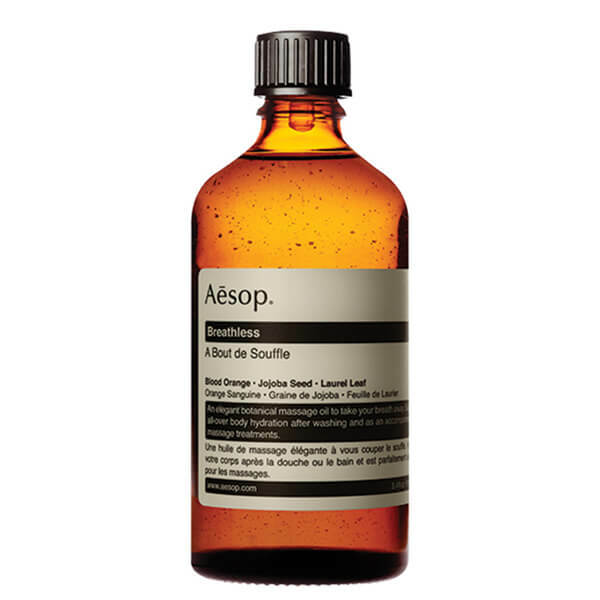 Experience spa-like tranquillity with Aesop's Breathless Hydrating Body Treatment, a botanical massage oil for all-over hydration. Enriched with blood orange, jojoba seed and laurel leaf, the luxurious oil intensely moisturises and restores dry patches of skin, delivering ultimate hydration for a soft, supple body. The perfect accompaniment to massage treatments. Massage one teaspoon onto cleansed skin, concentrating on dry areas such as elbows and feet. To intensify hydration, blend with your preferred Aesop body balm. Prunus Amygdalus Dulcis (Sweet Almond) Oil, Macadamia Ternifolia Seed Oil, Simmondsia Chinensis (Jojoba) Seed Oil, Citrus Aurantium Dulcis (Orange) Oil, Tocopherol, Pogostemon Cablin Oil, Laurus Nobilis Oil, d-Limonene, Linalool, Citral.